We don’t often stop to consider the dangers that lurk right inside our homes. While we know to keep smoke detectors powered with new batteries and to limit the number of electronics plugged into an electrical outlet, we don’t necessarily think about others. 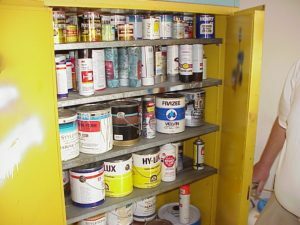 In practically every room in our home, even storage areas outside the house, there are many dangers, and, you should understand what these are in order to take action and make your place a bit more safe. Taking care of your property just makes good sense because it allows you to be comfortable and confident that you’re living in a clean, orderly environment. (Like offloading old fitness equipment.) We pick up around the house, and do other chores on a regular basis, but don’t take the time to get what can be quite hazardous out of our homes. Paint, lacquer, and other like products. Once you’ve done the job, it’s usually not worth holding on to little amounts of these. They can be a fire hazard, or worse, a health hazard, especially for small children. Lead pipes and electrical wiring. Lead pipes are common in pre-war homes, but can find in homes built after WWII. It presents a health hazard because as it ages, it carries more and more impurities. Electrical wiring becomes frail over time and can be a serious fire hazard that can strike quickly and without warning. Top-heavy objects that easily tip-over. These come in all shapes and sizes and are a safety hazards, especially to small, curious children. Old televisions, armoires, and other objects can be top-heavy and easy to tip over onto people, causing harm. Piled-up junk. You might have a pile of junk lying somewhere on your property and this not only presents a tripping hazard, but is also a fire hazard and a potential liability. What’s more, it’s quite likely that it is a code violation. Old electronics and appliances. These are not only eyesores, but can be a safety hazard, even a fire hazard. These are generally difficult to dispose of, precisely because of their internal components, which are considered an environmental hazard. If you have a bunch of junk garbage or old electronics, furniture, appliances, or other stuff, give us a call and we’ll pick them up and haul them away.